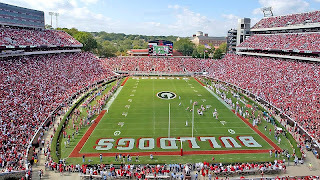 Over the weekend, the Georgia Sports Blog blew past 5 million page views for the site to date. In August, we served up 297,000 page views which topped our old one month record by 20,000 pages. In September, we've served up more than 350,000 page views. That's double the site traffic from the same period last year. I especially appreciate Quinton McDawg, Dawgnoxious, Jim Hipple and all of you who keep reading the site. I keep posting these milestone posts because you keep coming back. And of course DAWGBONE.NET!!! I've looked around to get a sense for how big the site has grown versus our peers, and I'm pretty sure that we're now one of the Top 5 independent, single team college football blogs on the Web in terms of page views per month. I know MGoBlog is bigger, but we stack up favorably to most of the rest. Not that it's a competition, but it's nice to have your stuff read by others. Thanks again for visiting. Continual entertaining and insightful commentary will usually breed success. I just recently started reading this website...I believe it was the week of the South Carolina game. I'm the same as Brett, I check in probably 10 times a day. You have some great info on this site and your breakdown of the Bama game was about as accurate as they could be. yeah, i read a lot too..got hooked pre-season..and stumbled onto it after "everyday should be saturday" great stuff, man. :) keep it classy. Way to go PWD & thank you! I struggle to update once a freakin' month. From one blogger to another, congrats. You guys do a great job, and I check the site at least four or five times a day. Keep up the good work! Thanks to this blog my obsessive compulsive disorder is confirmed. PWD, great job man. I have been on here for two years or so and I check this sight about 10 times a day. I cant wait to see your post everyday. And y'all dont think the season is over yet. We are in a better position now than we were last year at this time. PWD has a case of the want-its! I'm with Mike, I've been here now only since spring ball. This, the Senator's and AJC is all I read everyday (about 4x daily)(David Hale & ESPN's SEC occasionally, however I can't stand to post on ESPN). I believe I speak for all here, we really appreciate the time and labor you guys put into this site. I was thinking about why I like your blog the other day and I came to the conclusion that while you have some really funny stuff, mainly you are a great table-setter or in the world of comedy "the straight man". You are a die hard fan while remaining rational and balanced. Too many bloggers try to be too much or too schticky. Great job, keep it up! I am into my second season with you guys and you are definitely the best. I love "Hey Jenny Slater" too even though Doug called me Mark May once. Very good points. We should be a different squad when healthy and back to normal - unfortunately, that isn't going to happen until next year when we get Owens, Sturdivant, and Washington back full speed. By then, their replacements will have made tremendous strides and will gain valuable experience. But I'm not about "next year".....I'm about right now. And we have the team, when healthy, to compete for a NC. Question - did Q. banks play Saturday? If not, add him to the list. You mention a major shift in the east....what about a major shift in the west. Bama, Ole Miss, etc are looking up while AU is looking down. LSU - who knows?? The Gators are crying themselves a new St. Johns river here in Jacksonville after losing to an unranked team at home. In their spoiled arrogance, they actually think it's impossible for them to lose to Ole Miss at home. Here's a hint Georgia COACHING STAFF - contain PERCY HARVIN!!! We need to get healthy and mean - QUICK! Hands down the best UGA blog site around. You are the Larry Munson of bloggers my friend. GO DAWGS! now more than ever. I also wish to remain anonymous for the sheer mystery of it all. Awesome work men. Everyone else has said it all. Keep up the great work or I might actually have to talk to my wife. I'm surprised so many people still read the blog after finding out that you are really a girl. Wow - you must be extremely proud of what you've done. It's the goal of all us bloggers.